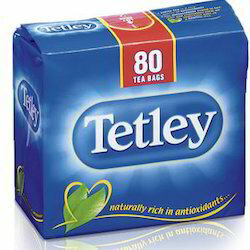 Tetley Tea Bags offered is made available in packaging of 240 bags. Material: Unbleached natural Filter Paper. With our vast industry experience and state-of-the-art infrastructure, we, Earth Expo Company , are able to provide the most effective formulations in the form of health care products to our clients. Being a leading enterprise of this industry, we are offering a huge range of Tagless Tea Bag. Enriched by our vast industrial experience in this domain, we are into providing Paper Envelope Tea Bag. TEA BOX of 100 Tea bags each of 2gms handpicked and packed in rectangular tea bags. The quality of tea bags is that of double chamber with finest and whitest colour tea bags.This tea conforms to FSSAI standards. Containing high contents of Vitamin C, & A, Potassium, Protein, Antioxidants, Calcium, etc., our Moringa Tea Bag gives a refreshing cup of tea. The Moringa Tea Bag brings energy back and adds upon the health of a person. The clients can avail from us the high quality Moringa Tea Bag, which is the best Herbal Tea. This is the most exclusive tea, as the unopen buds are picked from specially cultivated bushes in just a few days at the beginning of the season. The leaves are not fermented but instead left to wither naturally, then steamed. The pale, yellow tea they produce is low in caffeine and tastes mild and lightly sweet. Also known as 'silver needle', white tip should be served without milk.